my favourite meal of the week. And one of our favourite places to go is Oxford St in Bulimba, a street filled with dozens of cafes, restaurants, quirky fashion boutiques and the Balmoral cinemas (our local). Today we went to the Riverbend Teahouse, a gorgeous bookshop and cafe that is pretty well known in these parts. We arrived just after 10am and the place was buzzing. They were totally full but we managed to grab a couple of seats at the bar overlooking the street. I actually preferred this to being seated in the midst of heaps of people. N always has a something sweet when we go out for breakfast whereas I'm the opposite. I can't handle too much sugar first thing in the morning, and I also like to choose things I wouldn't normally make at home. Today N chose a waffle stack with apple and sultana compote, poached peaches and marscapone. Delicious! (No photo of this one). I had a poached egg (on the way out we noticed the menu said there were supposed to be 2 eggs?) on a spinach and fetta muffin with verjuice hollondaise. It was divine. 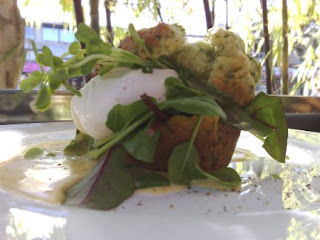 The muffin was crumbly and salty and contrasted beautifully with the softness of the egg and smooth hollondaise. We also had a 'jungle juice' each - I had orange, pineapple and mint, N had apple, cranberry and ginger. Both were delicious! If you're in Brisbane I highly recommend checking out Riverbend. Just remember to book!